Making beans takes time but we have to wait for every good thing, anyway. 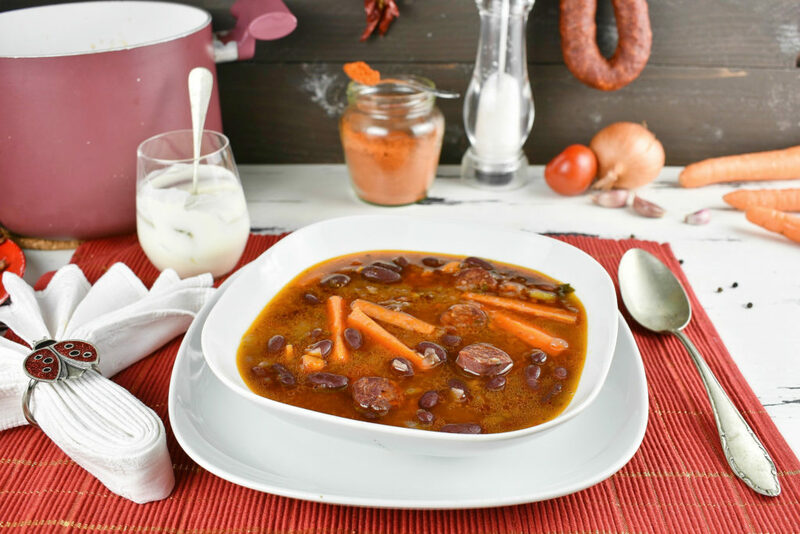 This red bean kidney soup has all the goodies one would need for a lovely meal. As they say, not every carbs being created equal. There are bad carbs and good carbs nowadays. The bad carbs are the ones that haven’t got much nutritional benefits for our body. These carbs mostly provide a ton of pure energy quickly which gets absorbed by our body quickly and as a result of all this we get hungry again quickly. As an evolutionary result of our being between these feasting periods we are putting on extra weight getting ready for the times when there won’t be much food available. The only problem is that probably that time won’t come into our super civilized industrialized life. In our XXI. century prowling area food is only a door away and opening that door doesn’t burn much calories. The good carbs are supposed to be better carbs because -apart of the energy- we gain various vitamins, minerals and fiber that our body needs to function well. These carbs are being absorbed slower by our body which results elongated times feeling satisfied and looking for food again. Fewer meals results less calorie intake and on the long run balanced diet with less fat on us. When we worked on farms toiling soil all day long there were no such things though. In those times bad carbs were the good carbs because they provided sufficient calories for the long day of work in the harsh environment. Nonetheless if they didn’t get the vitamins and minerals that resulted in weakened immune system and early death by some trivial common cold virus. Beans are high in protein, folate, iron and complex carbohydrates. 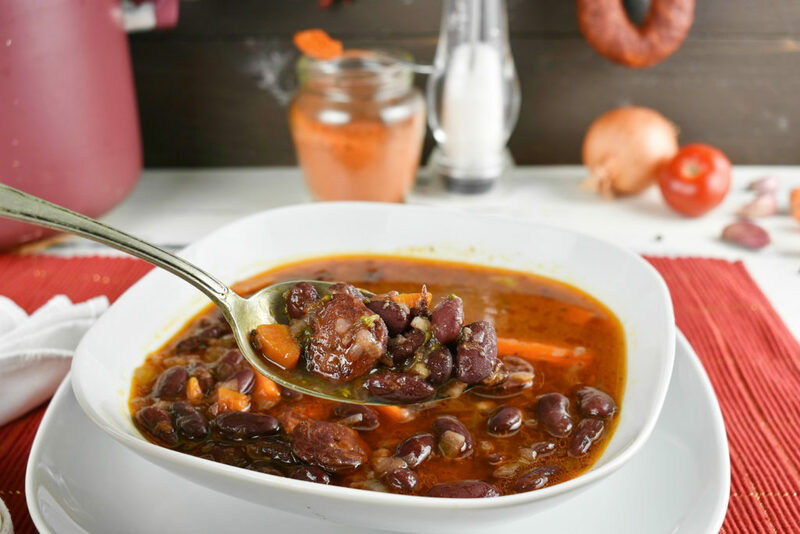 Consuming beans adds significant amount of fiber and soluble fiber to a diet, with one cup of cooked beans providing between nine and thirteen grams of fiber. Soluble fiber could help lower blood cholesterol. Adults are recommended to have up to two (female), and three (male) servings. 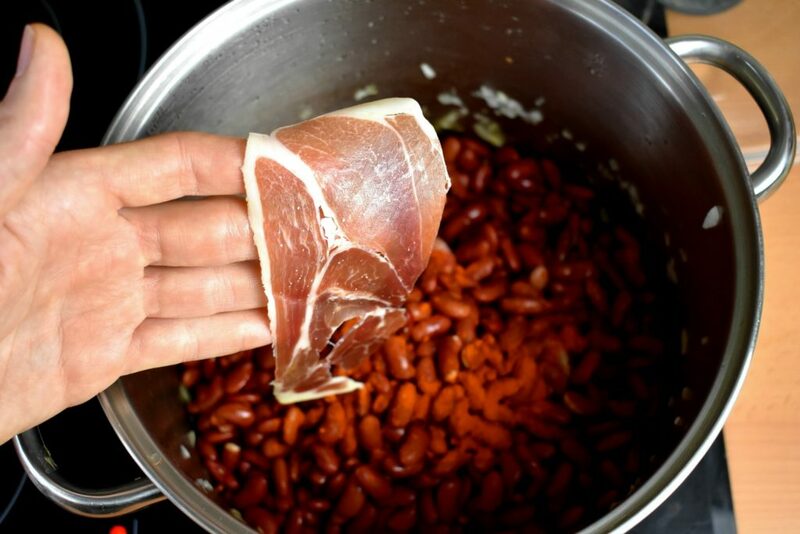 3/4 cup of cooked beans provide one serving. So red kidney beans are good carbs except they are toxic and we can die from eating them raw. We have to boil them for at least 30 minutes to reduce its toxin content to unharmful level. Not as they were such fun to eat them raw as anyone would want to chew on them but if somebody is thinking about using a nice and shiny slow cooker it isn’t recommended for red kidney beans. 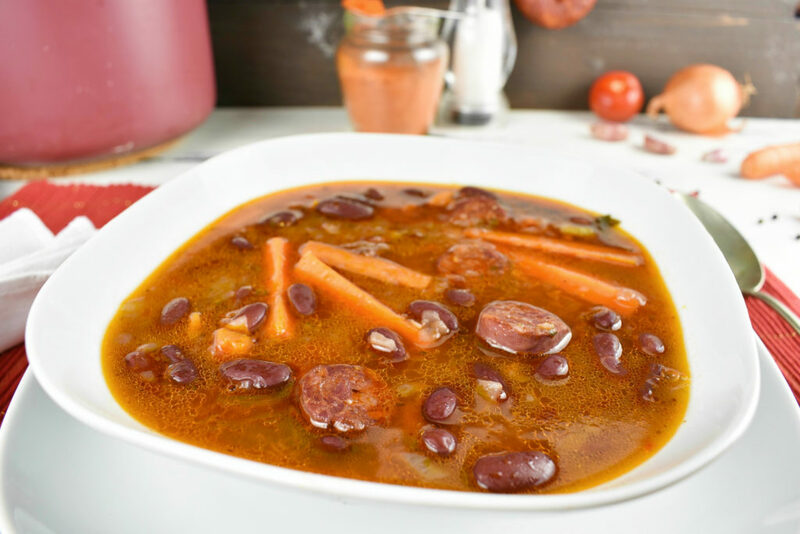 This recipe will use all the goodies one can find making a lovely meat filled soup or some may call it red bean stew but at the end the name won’t matter much. Only the taste matters. We use here salted and sliced pork belly to make the fat necessary to fry the onion but that can be completely substituted with cooking oil too. It’s up to individual tastes what to use here as it won’t affect the outcome too much. Onions can be left longer on low heat to caramelize instead of the simple translucent/glassy look. The caramelized onion will provide thicker texture as it will dissolve in the soup and it will provide a slightly sweeter taste at the end. 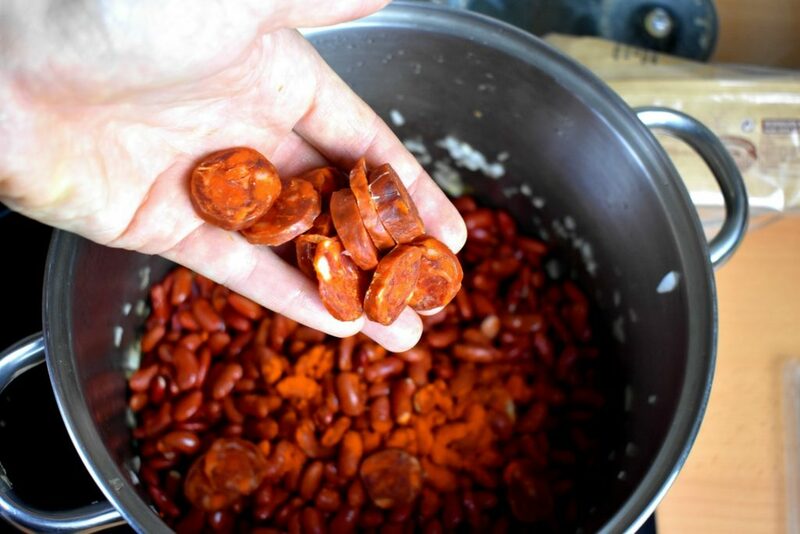 Smoked and dried Spanish chorizo and ham can be used if available as flavor enhancers providing a smokey aftertaste for the red bean soup. Although, these can be hard to get ingredients so substituting them with smoked bacon of some sort could be an option as well as leaving them completely out too. 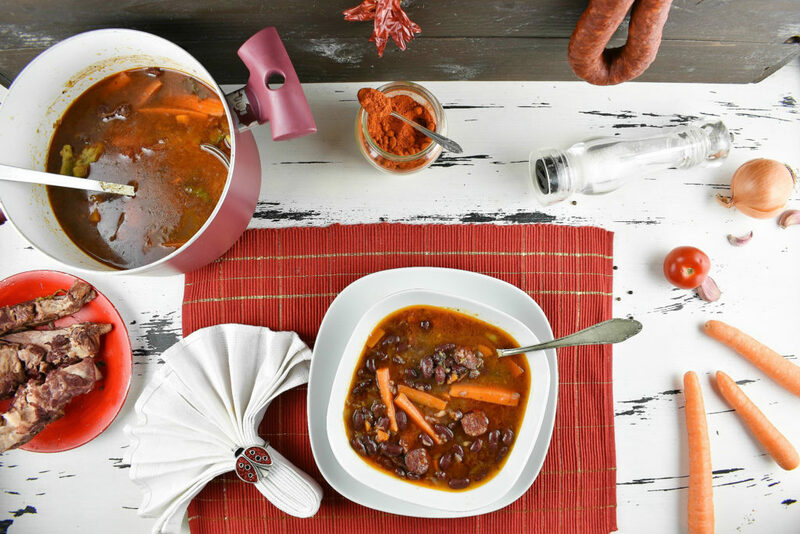 This red bean soup recipe uses creame fresh to thicken the soup’s texture and bind together the flavors of various meats but it can be substituted with sour cream or plain yogurt as well if necessary. This is completely optional and should be served in a saucer separate to the soup allowing everybody the freedom of choice. Dry beans needs to be soaked well before cooking. Generally it needs at least 12 hours of soaking but instructions are on the packaging for the particular types. 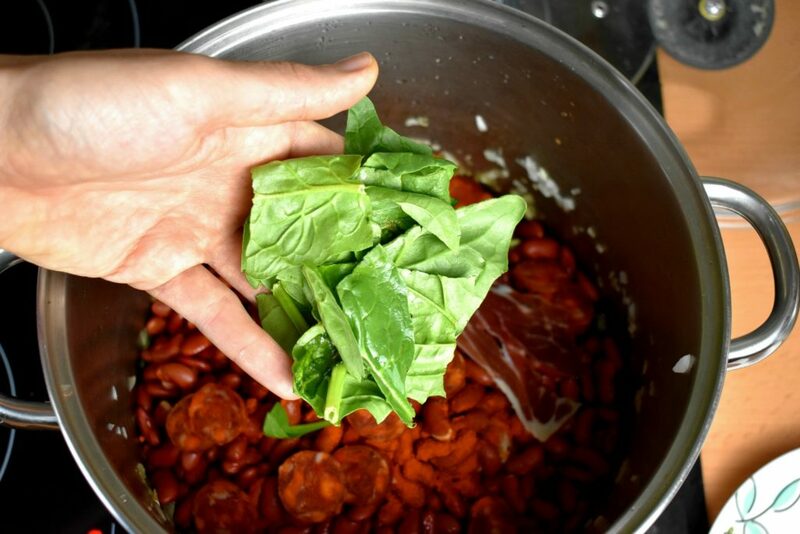 Rinse the beans before placing them into a pot. Fill the pot with water and then add a teaspoon of salt to the soaking water. Put the lid on as to avoid any unwelcomed guest dying into our next day meal. Slice up the pork belly or the bacon then fry it on medium heat until it loses most of its fat content. We can skip this step and use any kind of cooking oil or lard instead of making one. Add the diced onion on top with a teaspoon of salt. Saute the onion until it gets a translucent/glassy look then add the diced carrot too. 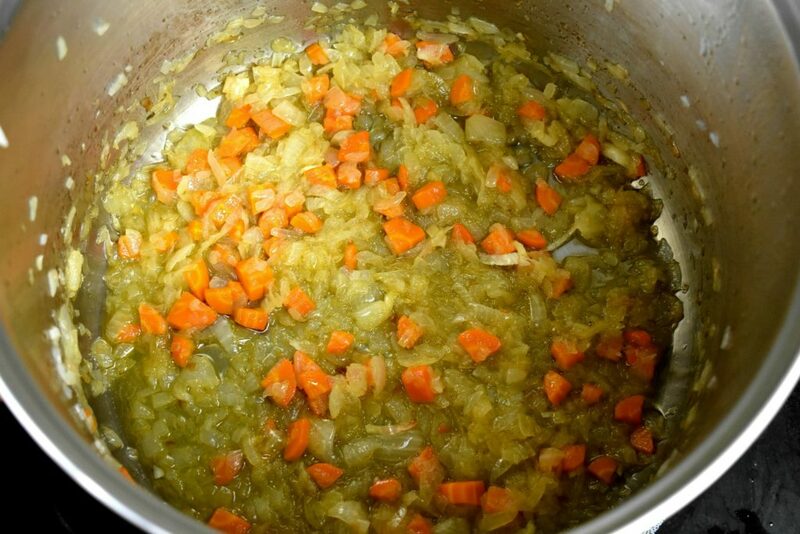 If there is time we can also caramelize a bit the onion and the carrot here by lowering the heat and frying and stirring it until it gets a light brownish color. This would take around 15-25 minutes. 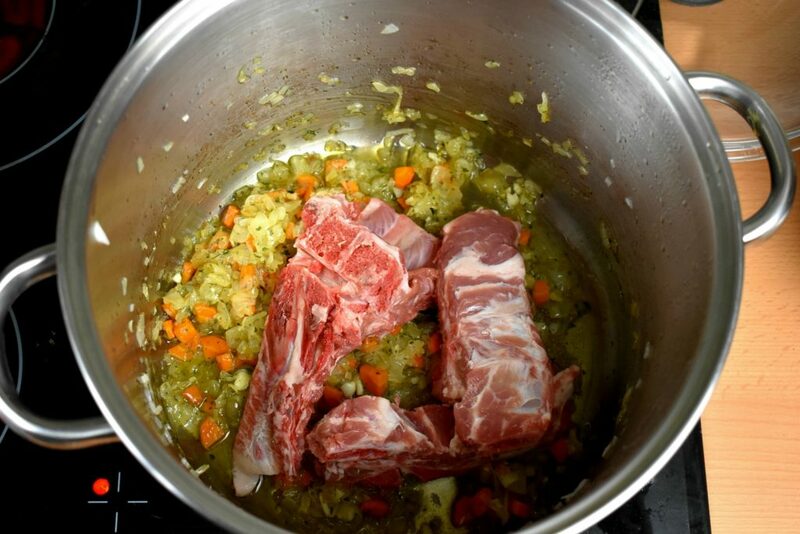 It gives a scent of sweet taste to the soup and a thicker texture at the end so it’s definitely worth it. Add the chopped up or sliced garlic, black pepper and parsley then saute it for a minute or so until the garlic lets out it’s lovely scent. Mind not to burn it though as that will ruin the dish. Add the meat or the bone and mix it together with the onion as much as possible. 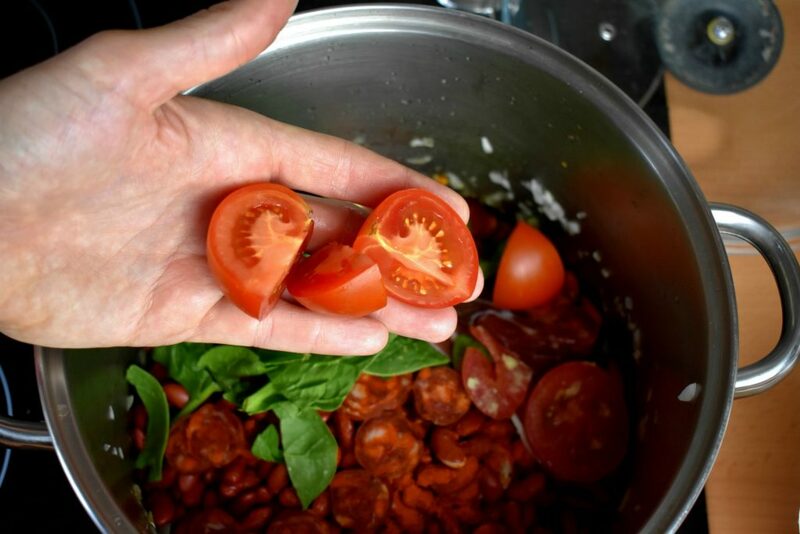 Add the beans, paprika or cajun and the optional ham, chorizo spinach leaves and the tomato. Mind not the fry the paprika as it burns quickly and can ruin the dish. When the beans were washed before being soaked then we can use the soaking water for cooking as well otherwise it’s better the rinse them before pouring it into the cooking pot. It’s a bit tricky to know the right amount of water at first try so draining the soaking water into a measuring jug to know what amount we are using could be a good idea. Less water is never a problem though as we can always add more to it. 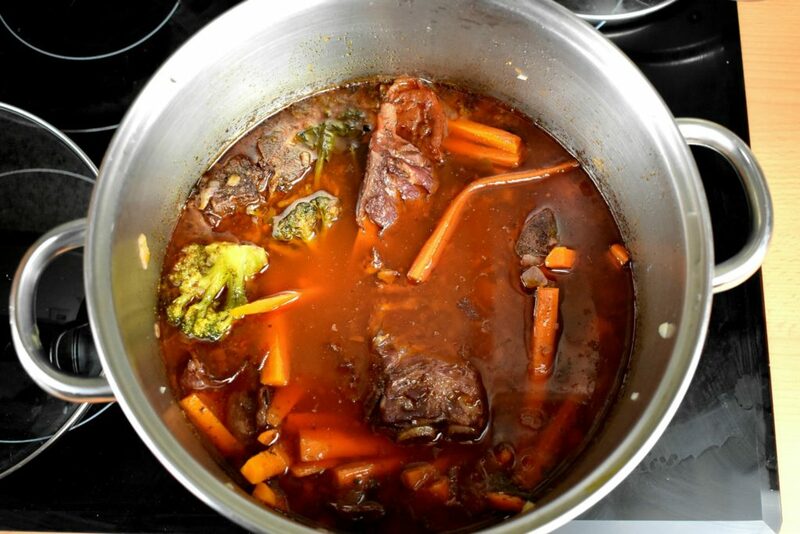 Too much water could ruin the soup in a second by making it too thin in texture and flavor. Add the parsnip or the Hamburg parsley root or both to the soup if available. Put the lid on and cook it on slow heat for about an hour. After 50 minutes check by tasting if the beans are tender enough or still too tough. When the beans are soft but still have some hard bits that means that it’s soon going to be ready. 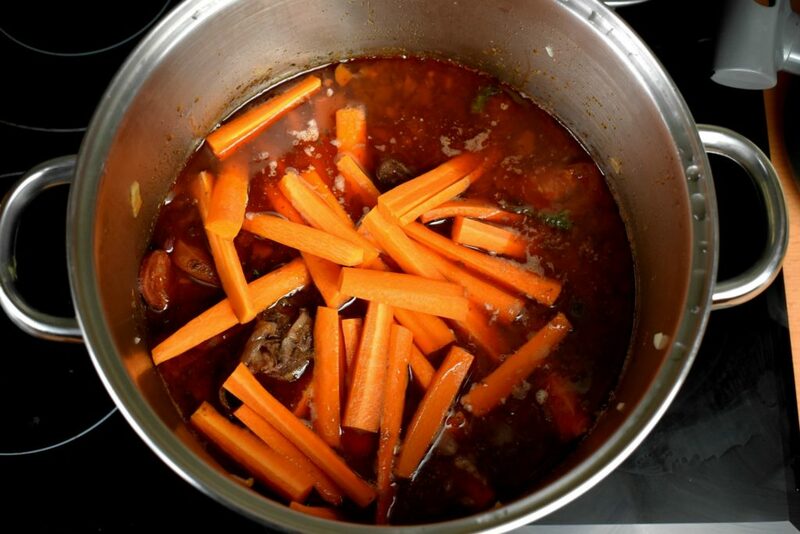 Add the carrots then bring the water to boil. From the boiling point cook it for 10 more minutes. Serve it with a teaspoon of creame fraiche, sour cream or plain natural yoghurt. It can be kept in the fridge for 2-3 days sometimes even longer. Before serving heat the amount of soup we need to boil. If it gets foamy it is very likely that it’s gone. Further tasting and a sour unbearable taste would confirm our suspicion. Legumes are a great choice to make big batches then freeze them for later use. The red bean soup freezes well except maybe the carrots suffer from defrosting a little bit and they won’t be so crunchy as when cooked fresh. Otherwise, the soup tastes defrosted almost like fresh or sometimes even better as the second heating could thicken it’s texture and bring together its flavors. Add the diced onion on top with a teaspoon of salt. 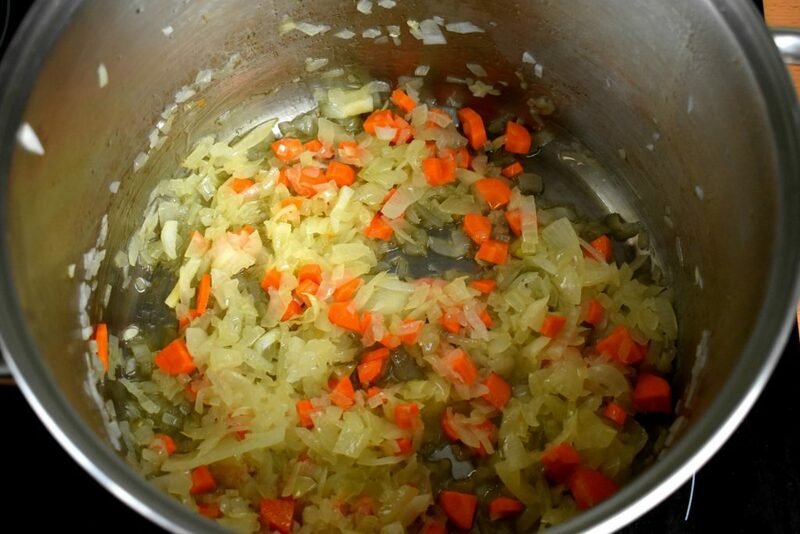 Saute the onion until it gets a translucent/glassy look then add the diced carrot too. If there is time we can also caramelize a bit the onion and the carrot here by lowering the heat and frying and stirring it until it gets a light brownish color. This would take around 15-25 minutes. 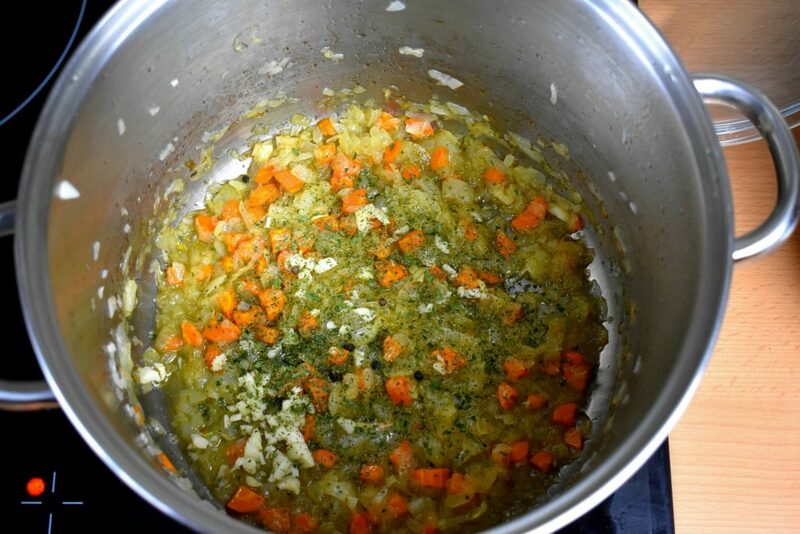 It gives a scent of sweet taste to the soup and a thicker texture at the end so it's definitely worth it. Add the chopped up or sliced garlic, black pepper and parsley then saute it for a minute or so until the garlic lets out it's lovely scent. Mind not to burn it though as that will ruin the dish. 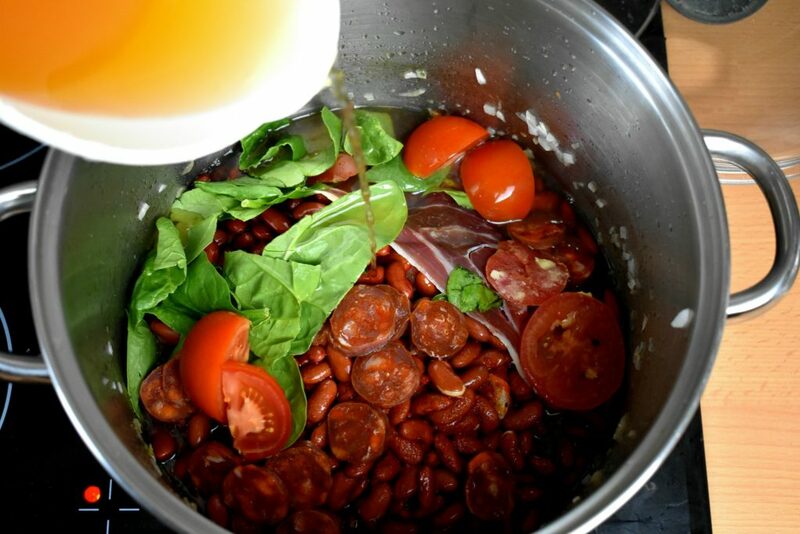 Add the beans, paprika or cajun and the optional ham, chorizo spinach leaves and the tomato. Mind not the fry the paprika as it burns quickly and can ruin the dish. When the beans were washed before being soaked then we can use the soaking water for cooking as well otherwise it's better the rinse them before pouring it into the cooking pot. It's a bit tricky to know the right amount of water at first try so draining the soaking water into a measuring jug to know what amount we are using could be a good idea. Less water is never a problem though as we can always add more to it. 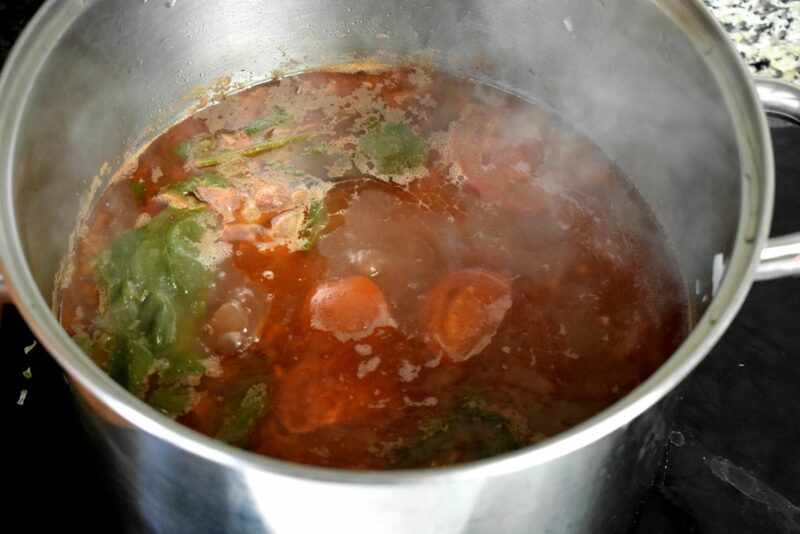 Too much water could ruin the soup in a second by making it too thin in texture and flavor. When the beans are soft but still have some hard bits that means that it's soon going to be ready. Add the carrots then bring the water to boil. From the boiling point cook it for 10 more minutes. Serve it with a teaspoon of creame fraiche, sour cream or plain natural yogurt.